The Tapestry of Time U.S. map combines two layers of information into one map display. Through computer processing, the USGS has merged data from maps that depict the topography with data from geology maps of the United States to form this attractive map. The resulting map has a 3-D perspective of the landscapes, and bright coloration to indicate geologic ages of underlying rock formations. This digital tapestry outlines the geologic story of continental collision and break-up, mountain-building, river erosion and deposition, ice-cap glaciation, volcanism, and other events and processes that have shaped the region over the last 2.6 billion years. 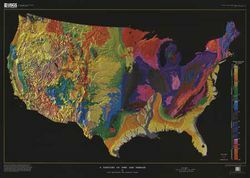 Large, colorful geologic map of the United States that is informative and also makes a great wall map!